Hello and welcome to our modern and chic studio rooms and villas with dramatic uninterrupted Pacific Ocean views you'll never forget. Sit back, relax and unwind and experience the luxury of Doubtless Bay Villas. 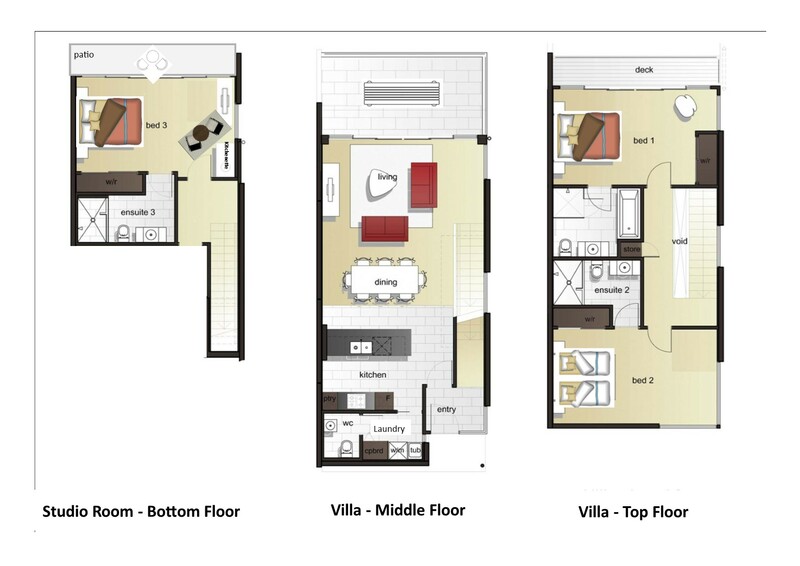 Your 5-Star apartment style Northland accommodation is spread over three levels (see diagram). Studio Room: (with stairs down to bottom floor) which sleeps 2 (King or a King bed which splits into singles) ensuite shower room and kitchenette – kettle, toaster, microwave and fridge only. Patio area with table chairs with uninterrupted views of the Karikari Peninsula and Pacific Ocean. 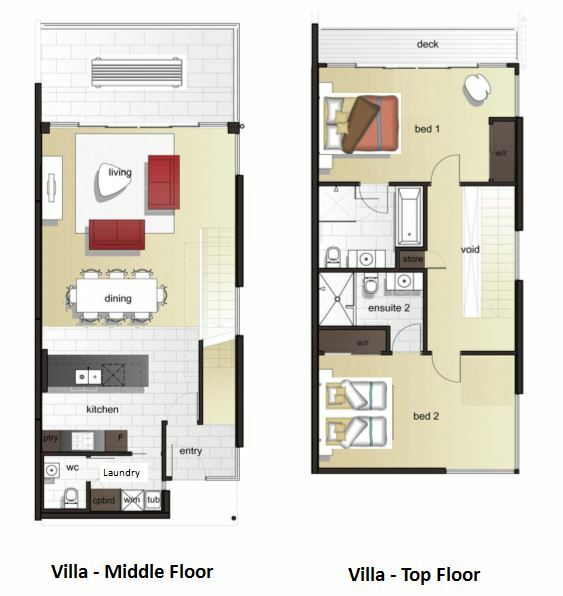 The Villas (middle floor) have a fully equipped kitchen with open plan dining area and lounge. Bi-fold doors which open up the full width of the Villa onto a balcony with table and chairs with spectacular uninterrupted views of the Karikari Peninsula and Pacific Ocean. Master and 2nd bedrooms upstairs on the top floor. Portacots are available for any under 2 year olds free of charge. All Villas and Studios are serviced daily and have free access to WiFi and Sky TV (including Sports and Movie channels) and are Non Smoking. Please note: There are stairs down to the Studio room from the middle floor and stairs up to the bedrooms in the Villa. Sleeps 2 (King or a King bed which splits into singles). Ensuite bathroom. Kitchenette with toaster, kettle, fridge and microwave (only). Serviced daily. Patio with ocean views. On-site parking available. Non Smoking. Sleeps 2 (King or a King bed which splits into singles). Ensuite with bath. Fully equipped kitchen and laundry. Large living and dining area. Serviced daily. Private balcony with stunning Pacific Ocean views. Individual or on-site parking available. Non Smoking. Sleeps 4 (King and King bed which splits into singles). Ensuite with bath 2nd bedroom ensuite shower only. Fully equipped kitchen and laundry. Large living and dining area. Serviced daily. Private balcony with stunning Pacific Ocean views. Individual or on-site parking available. Non Smoking. Sleeps 6 (King and 2 x King bed which splits into singles). Ensuite with bath, 2nd and 3rd bedrooms ensuite showers only. Fully equipped kitchen and laundry. Large living and dining area. Serviced daily. Private balcony with stunning Pacific Ocean views. Individual or on-site parking available. Non Smoking. ARRIVAL and DEPARTURE TIMES : Unless otherwise agreed, arrival time shall be after 14:00 and departure time shall be 10:30am. Where continued occupancy is required you may be charged one full night's rate, or part thereof. PLEASE NOTE: Reception closes at 6:30pm. If you require a late check in please contact us directly. TERMS & CONDITIONS: All rates and packages are current at the time of publication however must be confirmed at the time of booking. To confirm your reservation we request you provide credit card details. No charges will be made against this card until checkout, or unless our cancellation policy is applied. CANCELLATION FEES / POLICY: Written notification of cancellation must be sent to us by fax / email. The cancellation shall be deemed effective on the day we receive the fax/email.